Your hands are one of your greatest assets in the sport of hockey, if not the most important asset. The stick will be the most important piece of equipment you buy, but what about your gloves? The one thing between you and your stick right? The gloves you wear are extremely important! Knowing what your right size is is important so you feel comfortable and confident. So we here at What All The Pros Use have invested a lot of time in finding the best hockey gloves on the market for player’s on a budget and also those who want to take their game to next level. You might be in a bit of a hurry, so here are our featured recommendations which is the best three gloves on the market right now. 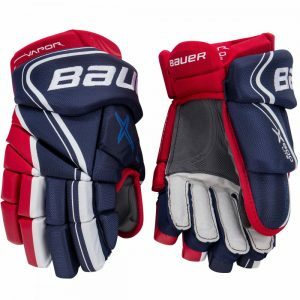 If you are looking for junior hockey gloves, then save yourself heaps of time and check out our Ultimate Junior Hockey Equipment Buying Guide for 2019. Every glove has its own unique feel to it. The things that go into this are the weight, materials used, padding, flexibility, The ‘roll’, and the protection. All these things go into the overall ‘feel’ of the gloves and how they perform. Everyone has their own opinion on what feels the best so that’s why we’re going to show you how to get it right the first time. Many things go into this, There’s so many factors that go into weight whether its padding, material, or even the gloves ability to wick sweat. When choosing a glove, it’s important to take these into consideration because if your gloves are heavy, it’s going to wear your wrist down over time. This will decrease your speed in your hands and your ability to score. So when you go to the store or you’re looking online, be sure to look into weight… very simple as well as important. When player’s are shopping for gloves, they usually don’t measure for their size which can be a problem. I’ve heard a lot of my team mates complain about how their glove is too big or too small. It’s only because they didn’t take the time to measure for their gloves. You may be asking the question what size gloves do I need? or how are hockey gloves measured? It’s very simple actually to find the right gloves to fit your needs. So we’ve created a go to guide on how to find the right size. We also have another review that goes into this more in depth here; Hockey Glove Fitting. Using this guide will help you find the right size glove. This isn’t the only thing you want to consider though, companies also different fits. I’m sure you’ve heard of Bauer’s Vapor, Supreme, And Nexus. Each fit is unique and carries it’s own perks and drawbacks. Let’s look at an example of what you will see with companies different fittings. You will notice there is generally 3 different fittings, Now i’m going to go into what these mean and match them up to the companies that present them. The traditional fit is going to be you more relaxed fit, in other words made for bigger hands. The Tapered fit is the tightest of the three, more for your smaller hands or anyone who likes a snug fit. The contoured fit is the most natural, more for average sized hands. these are the most worn of the three. 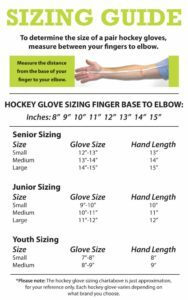 We hope this chart helped you in choosing the right hockey gloves, we try to make it as effortless as possible here at What All The Pros Use so you can get all your info from one source. Now we will get into what you’ve been waiting for, we have set up our stats for each glove that will help you choose exactly what your looking for in a glove. We will show you the most important features of each one. Some are on the higher end of the price spectrum but we have tried to pick out from different price points. You can also save yourself a heap of time by clicking on the name of the glove in the table below which will take you down to the review instead of scrolling all the way down! So let’s get into the top ten best hockey gloves. As soon as these are unboxed, you can’t help but noticed the cool graphics and colors which are reinforced with a 3D embroidered Bauer logo across the cuff and a rubberized 1X logo on the thumb. You can feel the nylon and cable mesh on the exterior of the glove which provides a clean look with excellent durability and breath-ability. The synthetic leather protects the high wear areas and helps extend the life of these gloves. Getting to the most important part… the protection! There is a triple density design in the backhand of the glove where they have this high tech PORON XRD Foam baselayer. This is a type of foam you usually see in the top line helmets that Bauer make and is known for reacting differently to different levels of impact. This helps protect against 90% of force incurred during impact out on the ice. We then have the medium density foam reinforced with air light foam which is a high tech material designed to be lighter without compensating protection levels. The three-piece index finger and thumb improves flexibility that’s going to allow you to get a really good wrap on your hockey stick and offer fantastic range of motion while not sacrificing any protection. In the palm, Bauer uses a pro-level AX Suede Quattro Grip palm with a durability patch where holes typically begin to form. This significantly enhances the durability of the palm, while still giving players amazing stick feel. As an added feature, the AX Suede fingers will match the color of the glove. The Bauer 1X gloves feature a 37.5™ liner, which uses a player’s body heat to speed up the evaporation process 5 times faster than other performance fabrics. To enhance protection and comfort, the 1X glove also has a thin XRD® backhand pad complemented by comfort foams. The interior of the glove opens up to a very mobile Free Flex Cuff that flares out in a segmented design to move with the player’s wrist movements, providing great wrist mobility and ensuring that the protection stays in place. Verdict: The first thing we noticed was the fit. It takes a few go’s before they are broken in but once they are, they have a snug feel with great protection all around. The glove like feel also converted into a better feel with my stick. Price wise, they are a little on the higher end but it’s worth it due to the quality and durability of these gloves. You can also find out more about the prices here at Hockey Monkey. Now, we’ve always loved Easton products on here and believe they have made some awesome products in the past. They aren’t around so much anymore but this is still such a good offering in terms of hockey gloves. It is loaded with some really good features. You are going to get amazing comfort, reliable fit and top level protection. Protection wise, we will see what Easton calls 3Shox infused with Helix 10 which is a three layer foam set up. So, a combination of high density foam, medium density foam and helix 10 designed to protect you from high impact contact that may occur out on the ice. If we talk about the fit then you are going to have the contoured fit which we find through the Synergy range. For the palm the Easton team has used a very advanced technology such as Sinq microsuede material along the centre which provides that awesome stick feel and stays ventilated. Looking inside the glove, there’s also great bit of technology to help you stay cool as well as comfortable while you have these on. The Nano-sense thermal liner and Bio-Dri technology helps achieve this and is a great addition from Easton. Verdict: This is probably considered one of the higher end gloves and there are not many gloves out there that will beat it for all-round performance. We absolutely love the snug fit which wraps around the entire hand and provides jut such awesome feel. They feel like feathers on you hands and will keep you feeling light out on the ice. Such great price for these too and currently on sale here at Hockey Monkey so worth checking out. The CCM Quicklite 250 is offering best construction and protection along with really good material. The CCM team has done a tremendous job with this product and you are going to get amazing results with this product in hand. The gloves are really lightweight and protective. If we talk about the constructin then the lightweight polyester is being used which has made the CCM Quicklite 250 very light and also very comfortable as well. So, the construction of the gloves has mainly focused on providing great comfort and lightweight material. For the protection and material, you are going to see PE Foam with PE inserts on back hand. 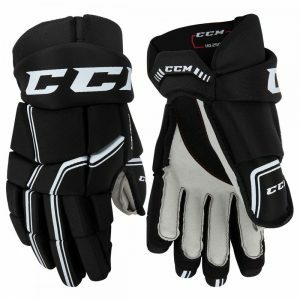 So, this will cover your backhand and fingers and again the construction of this part is very lightweight as well and the CCM team has done all that without compromising on the protection of the gloves. In other words, you will be getting great comfort, top level protection and lightweight product all at the same time. For the protection of the thumbg there is a regular PE thumb which will protection the thumb from any damage. In order to provide great comfort and protection form high impacts shots the CCM team has used the soft nash palm with reinforcements which will give your palm a really nice soft feel and durability. The segmented cuff will offer you great flexibility and protection. Verdict: If you are a beginner just getting into hockey, then I’m not sure there is a better pair of glove in terms of value (especially these on hockey monkey). They are just an awesome all round set of gloves that fit so well and feel comfortable. Great product that is full of value and will not disappoint. Incredible feel on the stick! Don’t you want really cool, durable, comfortable and supportive gloves for your game? Well, if you do then the Bauer Vapor X800 Lite Senior Hockey Gloves are there for you. 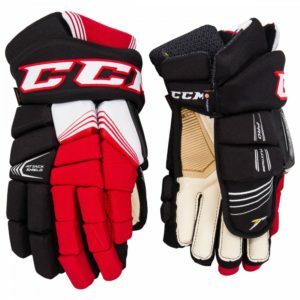 These gloves are durable and you will get a great grip on your stick as well. If we talk about the outlook or the external look then they have used the Cable Mesh with the lightweight PU overlay. So, you are going to feel very comfortable, easy breathing and above the cable mesh material is abrasion resistant as well. The flexibility of the mesh material is really amazing as well. You are going to get amazing feel and fit. 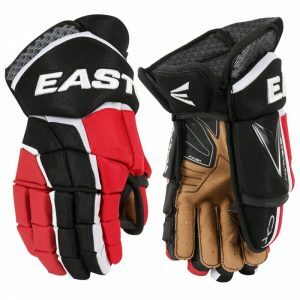 On the other hand, the synthetic PU overlay in the gloves will provide you with great durability. On the fingers and on the backhand the Bauer team has used dual density foams with PE inserts. So, the key areas of your hands will get amazing protection and you can make your shots with full strength. All the high density foams used will save you from different dangerous things like the hypertension. This product is one of the best and the great durability is the main highlight of this product. You can easily flex your hands and can make any sort of short in any condition. Their two-piece flex-lock thumb is there to give you an extra edge as well. The construction of the gloves is very good and that is why the airflow and breath-ability is at its peak. The liner features a dual zone material and the brushed nylon with the microfiber is also there. So, now what it does? Well, it will save you from getting wet and you will remain nice and dry while playing the game. It will do a great job of wicking away moisture. Well, this year they have introduced something new that is their Sanitized technology. Its directly embedded into all the fabric so it never washes out and it will also help to control odor by preventing that odor causing bacteria. The Sanitized Actifresh keeps gear smelling fresh by preventing odor causing bacteria from forming. 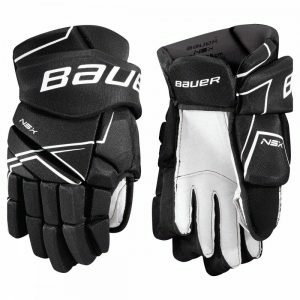 The overall look of the gloves is very cool as well the embroidered logo of Bauer looks really good. The nice printing makes the gloves stylish and eye-catching. Verdict: The gloves really amazing and you will definitely love the product. They have provided great durability and amazing fit. The tapered fit on fingers (snug), backhand (snug) and cuff (relaxed). So, do give it a try and you can grab these at such a good price (like this one from Hockey Monkey). The Bauer NSX is an excellent product from top to bottom it has really cool to features to offer. It easily meet the professional standards and from comfort to protection level to durability to construction of the material the Bauer team has done a great job with this product. Now if we start with the exterior of the gloves then there is a very nice poly mesh material used. So, this will provide your hands very nice breathability and it will make you stay nice and fresh all the time during the games. 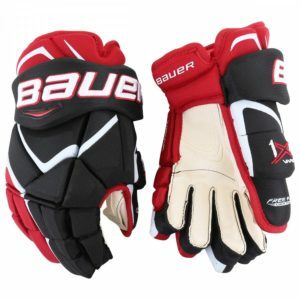 The Bauer NSX glove also offers really good durability and it does a great job by resisting the wear and tear. The gloves do have really good flexibility properties as well. Now if we talk about the protection then the Bauer team has focused heavily on providing great protection. The dual density foams have been used to ensure great protection. The backhand also has medium density foams. Furthermore, the plastic inserts have been used in different sections of the gloves to take that protection to a whole new level. For the thumb protection, you are going to see a two-piece design so this will give you a really good flexibility which will allow you a good hold on the stick and also it will provide you really good dexterity out of the box. Apart from this, there is ivory nash material used for the palm as well and it will increase the comfort and protection of this section. The dynamic flex technology will give you great mobility and an extra range of motion. So, overall the Bauer NSX is a really good product and it offers great comfort, amazing durability and reliable protection. Verdict: You’ll see Bauer does get a quite a few mentions on the list and you probably know they have quite a lot of choice available on the market especially these NSX’s. One thing we noticed with these is the great mobility in the fingers which helped with the stick handling. We have also heard that they are very durable and will hold up nicely. Awesome pair of gloves and if you want to buy them, you can find them on Hockey Monkey here. 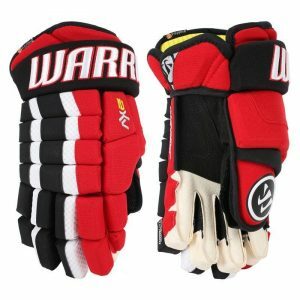 The Warrior Dynasty AX2 is offering you really great fit, durability, elite level protection and amazing comfort. So, if we see the exterior of the gloves then you will see a variety of materials being used by the Warrior to make it a top quality product. As compared to the AX3 the nylon mesh used in this product is a little bit tougher nylon mesh. So, this will really increase the overall durability of the gloves. Now if we talk about the protection of the gloves, then I don’t think that there are better products available than the Warrior’s. because the Warrior team uses top level technology when it comes to the protection. Their WARLITE Impact Protection technology is really amazing and it literally takes the protection to a whole new level. The performance foam blend offers a protective, comfortable and light protection package. Furthermore, there are plastic inserts used in this technology as well which has provided defense against pucks and sticks. The mediums density faoms used in this technology has really taken the protection level to new heights. Now all these density foams have been combined with the plastic inserts which work really nicely to dissipate the impact energy like slashes or pucks. Now for the palm, you are going to see Authentic Pro Palm which will offer you great comfort, mobility and great feel as well. You will get a really good stick feel and the breathability factor is really good as well. The polygiene used in the Warrior Dynast AX2 are really good when it comes to giving you fresh feel all the time as it will move moisture away from your hand quickly because the evaporation process is real quick in it. The CCM Super Tacks Glove is the top of the line model in the second generation of this Tacks Line. It boasts some of the best protection on the market with its D3O smart foam that is one of the most impact-absorbant materials around. CCM then layered it with pro-level PE foam and plastic inserts, taking protection to the next level. The Super Tacks utilizes a similar Palm Extension previously found in the QuickLite family. The NHL ivory clarino extends further down the base of a player’s palm than most of its competition. It prevents the dreaded scrunching affect that occurs when the wrists are rolled inward which causes discomfort and decreased stick feel. CCM also included clarino overlays in key areas to ensure premium durability to match its comfort and protection levels. The entire liner uses premium microfiber with a Polygiene additive. The microfiber is buttery soft and comfortable, wick away moisture but the Polygiene prevents odor-causing bacteria from forming for lasting freshness. The two-piece pro thumb, the three-piece index and middle fingers, and the three-piece flared cuff work to provide players with second to none mobility so that this glove feels game-ready right out of the box. Verdict: Great fitting glove! These gloves so well designed and offer such good feel. Admittedly, they are on the premium end in terms of prices, but they are so good at protecting your hands with the D30 technology. Try them out (like these ones on Hockey Monkey) and you will definitely have the best looking gloves out on the ice. So comfy when you put these on right out the box! For protection, I noticed the phantom foam technology which are lightweight layers of EPP foams and plastic inserts for great lightweight impact protection. For the bottom three fingers, we see a two piece design while the index finger has a three piece design to provide good grip on your stick. On the thumb, we see Warriors Axi Flex thumb which is a two piece design giving you go flex and great grip on your stick while plastic reinforcements prevent against overextending your thumb ensuring great slash protection as well. When taking a look at the palm, you see the Smart Palm Plus technology which is a reinforced Nash construction which will offer great stick feel combined with excellent durability as well. The technology is placed only where it is needed in the palm so it does not dampen the stick feel and enhance the life of your glove. Another neat bit of protection is the foam extending into the side of the glove which is an extension of that nash which gives you good overall protection. Inside the glove, we have Wartech FNC which is a comfortable high tech microfibre liner which is very well ventilated providing a nice cool comfortable fit. Infused with Polygiene which is going to prevent odors from building up inside the glove. This extends out towards Axyflex Glove which is a flexible design for free wrist mobility for easy stick handling and shooting. 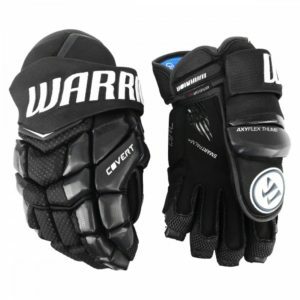 Verdict: We did an in-depth review on these, if you’d like to check it out click here ‘Warrior Covert QRL Senior Glove Review‘. These are overall probably the best gloves out there on the market. I mean it has every advantage you would want in a hockey glove! It’s flexible and lightweight while having some of the best protection out there. Overall these are one hell of a pair of gloves. If you want to check them out click here for them on Hockey Monkey. Super comfy and they look pretty cool! The Bauer Nexus N2900 Gloves are really comfortable and will provide you amazing protection. This is the second tier model in the Nexus line and they have used the nylon mesh material in the gloves for better results. For those who don’t know, the Nexus fit is one of the best in the business and it is Bauer’s second most popular fit amongst the professional’s players. Well, the gloves are really comfortable to use and the fitting these gloves provide is really good as well. The players will have more volume fit in the fingers and you can make your shots with full strength because the gloves are really good range of wrist dexterity for stick-handling. There is poly knit material uses for the finger gussets. So, the airflow through the fingers will be nice and cool. They have used the cable mesh for the exterior and it is very breathable and comfortable. The airflow is very impressive and the gloves are also abrasion resistant as well. There is synthetic leather overlay on the backhand two-tone and stitched Bauer logo into the cuff screen-printed graphics on the thumb. They have used really good density foams all the way throughout and then there are plastic inserts for better protection as well. The traditional ivory nash material is there to give you that traditional look and it is abrasion resistant too. There is three cuff design used in the gloves. There is full density foams used in the cuff so better protection overall. So, it will help you move as you want to but the protection remains as it is. The Thermo Max Liner – well, the thermo max liner is very useful and it is a microfiber like material that is very soft to touch. It also does a really good job of wicking away moisture to keep the gloves dry and cool. 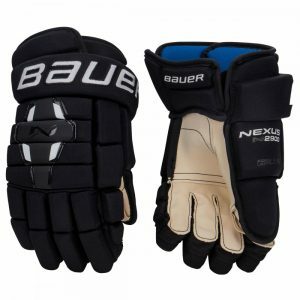 Verdict: So, you are going to get almost everything in the Bauer Nexus N2900 Gloves for a very reasonable price. 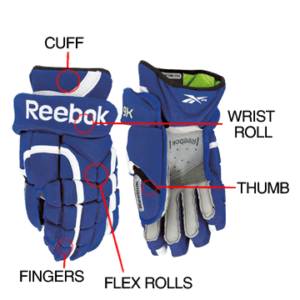 You should give this product a try (like this one on Hockey Monkey) and see it yourself how cool and useful these gloves are for your next game. The True A6.0 is one the most famous glove style available in the market today. From relaxed fit to great mobility to full range of motion to great protection there are so many amazing features in this product. So, you are going to get really good flexibility, breathability and high-level durability out of this product. Now if we talk about the construction then the exterior of the gloves is loaded with a pro nylon exterior so it will provide you really good flexibility and comfort. Pro Grade EPP Foam – the best part about this product is the FOAMS. There are thicker foams used in it as compared to the traditional hockey glove construction. If we compared it with the industry standard of 20mm then the TRUE Pro Grade EPP is 24mm Foam with the PE inserts. So, you can definitely see that the overall comfort and protection of the True A6.0 is way better than the other gloves out there. You are also going to see medium density foams everywhere in the gloves and it makes the gloves really protective and comfortable to wear as well. The product is lightweight as well and this is where the True A6.0 outsmarts its competitors because it is providing great comfort, durability and protection without compromising on being lightweight. The top three fingers also feature the triple segmentation design so it will give you really great flexibility and comfort. The construction of the gloves is really amazing and that is why you will get a great fit on the stick and a great fit means more power going into your shots which will result in more scoring opportunities. The True A6.0 is very advanced when it comes to the technology. The ZPalm interchangeable palm technology will allow the players to easily change the glove’s palm with any of True Hockey’s four additional palm options within no time. You will also get great range of motion with the TRUEFLEXX lock thumb and it will also provide amazing protection to your thumb as well. Verdict: Solid gloves with great protection! When you put these on, straigh away they will feel pretty comfortable and fit nicely on your hands. Considering how much they cost, they perform as well if not better than some of the premium options. You should give this product a try (like this one on Hockey Monkey) and the interchangeable palms helps with keeping them dry and disinfecting. We hope our list of hockey gloves helped you understand the best performing hockey gloves on the market right now. Also don’t forget to check out our other articles, we have tons of great information. That’s all from us here today. Have a great day!! !